I have just been raising my kids and enjoying life. My daughter is a nurse and has a little boy (Brenden) who is adorable and my son attends University of Centeral Missouri on a baseball scholorship and just last year competed in the NCAA divsion II World Series. 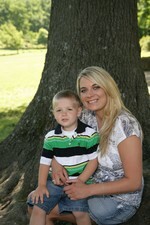 Angel Hansen Bradshaw updated her profile. View.